The rail industry continues to power the U.S. economy, with nearly 600 freight railroads in operation, according to the Association of American Railroads. It’s a 140,000-mile system that generated nearly $70 billion in revenue in 2016. In addition, the number of light-rail vehicles has increased by nearly 20% to more than 20,000 trainsets, locomotives and coaches since 2000, according to U.S. Commerce Department figures cited by Siemens AG. It’s a trend that signals a “renaissance in rail,” with passenger volume steadily increasing, Siemens reported. As interest in rail development and expansion increases, rail manufacturers and railway operators must be prepared to meet increased demand–whether it’s today or in 15 years. This includes the use of more efficient maintenance techniques. Nu-Star Inc. already has a solution available for this. The battery-powered material-handling solutions manufacturer offers a remote-control Power Pusher Rail Mover system that eliminates the inconvenience and potential safety issues of traditional railcar moving equipment. The mover can ride on railroad tracks and off railroad tracks for increased agility. 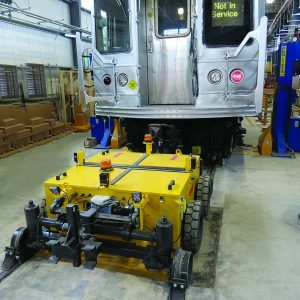 “What’s unique about it, is that it features a low profile, so it’s short enough to go underneath the train for servicing,” says Ryan Blesi, vice president of material handling and a design engineer in the Power Pusher division. For example, trains with bogies (electric wheelsets that go underneath the railway vehicle) come with many inherent challenges. The wheelsets can weigh up to 15 tons. Traditionally, workers raise the body and climb underneath to remove the wheelsets by hand for service and preventative maintenance. The elimination of cranes has potential cost and safety benefits, Blesi says. It also helps companies adapt to changing infrastructure needs. Ability to travel on and off rails. This is valuable for servicing trains where an open pit might exist between the tracks. The Power Pusher Rail Mover can travel on the tracks and can maneuver through turns and switches. Ability to move up to 220 tons, enough for a five-passenger car set. 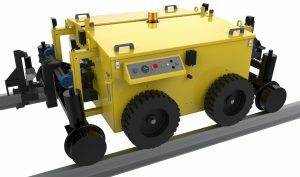 Powered connect/disconnect to rail cars via remote control for increased safety and efficiency. A zero-degree turning radius, which provides space savings because the unit doesn’t require as much area to make a turn. Nu-Star also offers customized options so companies can tailor the Power Pusher Rail Mover to connect with all types of cars, including older models.